The authors and illustrators of this book are Kindergarten GATE students at Bester Elementary School. They have been inspired by Mo Willems’ Pigeon books and decided to make their own. They have been learning about persuasive language. 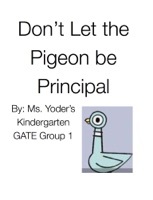 Let’s see if they can persuade you to let the Pigeon teach kindergarten!